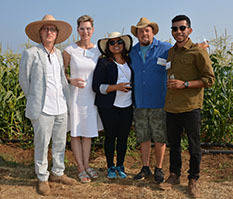 The 7th Farm to Fork fundraising dinner drew a sell-out crowd to the UCSC Farm. Left to right: Daniel Press, Marlene Tromp, Rosalinda Gallegos, Tim Galarneau, David Robles. 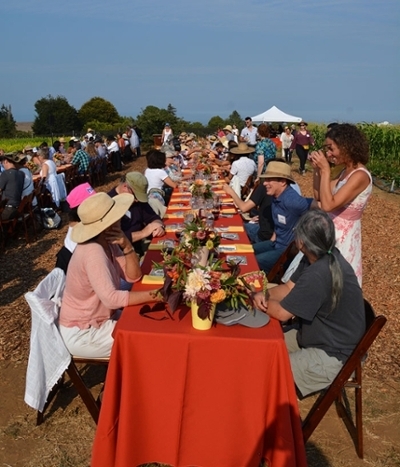 A beautiful summer afternoon greeted attendees of the 7th Farm to Fork fundraising event on the UCSC Farm. Founded by CASFS Farm & Garden Apprenticeship graduate Matthew Raiford in 2011, the event raises funds for educational programs managed by the Center for Agroecology & Sustainable Food Systems (CASFS). This year's sold-out event focused on the theme of "home," and the work that CASFS apprentices, students, staff, and faculty are doing to ensure food security and a sense of home for all UCSC students. As part of the basic needs efforts taking place through CASFS in partnership with other UCSC programs, a variety of of programs served more than 4,100 students in 2017–2018. Food raised on the UCSC Farm supplied free food pantries, low-cost organic produce sales, and dining hall meals. Other efforts included low-CalFresh sign ups, free cooking workshops, and a new basic needs website. Those efforts will expand this coming year when the Cowell Coffeeshop opens as a "basic needs café," offering students free coffee, tea, and prepared food, and hosting the east campus food pantry, nutrition workshops, and other programs. Enjoy the remarks made at the Farm to Fork dinner by (in order of appearance): Daniel Press, CASFS executive director, professor of environmental studies, and associate dean of social scienecs; Marlene Trump, UCSC's executive vice chancellor; Tim Galarneau, CASFS community-engaged education coordinator; Rosalinda Gallegos, UCSC dean of students coordinator; and David Robles, CASFS farm second-year apprentice.